Aaron I. Messing is a partner at A.Y. Strauss, and the founder of the firm’s technology practice. Aaron focuses his practice on startups and emerging growth companies, providing general counsel services for companies from formation through exit. Aaron frequently advises clients regarding legal, business, and strategic decisions throughout their business lifecycle, including corporate, business and technology transactions, information privacy and data security, angel and venture financings, mergers and acquisitions, and protection of intellectual property. Prior to joining A.Y. Strauss, Aaron practiced at a boutique full-service law firm, and served as Chief Privacy Officer for Advanced Health Media, LLC, a multinational technology and service provider, and as Chief Privacy and Security Officer for Avatar Solutions (acquired by Press Gainey), a leading enterprise health care consulting firm. Aaron was a Dean’s Fellow at Fordham University, a Ruth Whitehead Whaley Scholar, an Associate Editor of the Moot Court Board, and a member of the Journal of Corporate & Financial Law. 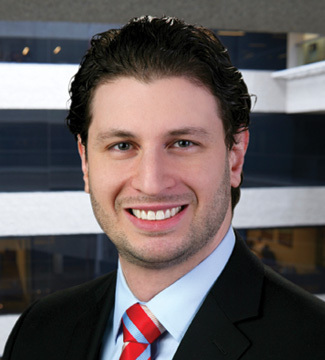 Aaron has been recognized as a New York Metro “Rising Star” by Super Lawyers from 2016-2018, and a New Jersey “Rising Star” from 2017-2018. He is also a member of the International Association of Privacy Professionals (Certified Information Privacy Professional/U.S.). • Represent early-stage and high growth companies in a variety of industries in connection with strategic equity investments and other capital financings. • Provide strategic and legal advice to various companies regarding general corporate matters including equity grants, employment compensation, and corporate organization and governance. • Represent on-demand services companies in connection with contract negotiation, strategic growth, employee and customer relations. • Represent various technology companies in connection with SaaS offerings to institutional clients. • Advise FinTech client in connection with complex contract negotiations with financial institutions and third-party vendors. • Negotiate software development agreements on behalf of mobile app design and development company. • Represent global technology and services company in connection with a wide range of commercial and technology contracts in connection with the client’s business, including software license, outsourcing, confidentiality, and services agreements. • Advise interactive advertising company in connection with negotiating affiliate and behavioral targeting agreements. • Draft and negotiate minimum advertised pricing, reseller and distribution agreements on behalf of well-known manufacturer of children’s furniture. • Advise consumer goods company in connection with licensing trademarks, manufacturing and distribution rights from a professional sports franchise. • Implement bespoke privacy and data security policies and procedures in connection with the collection and cross-border transfer of sensitive data. • Advise multinational fashion goods company in connection with e-commerce privacy compliance. • Represent luxury goods and electronic retailer in connection to a data breach and appeal of related fines and penalties. • Counsel various companies in connection with trademark and copyright protection and enforcement, intellectual property licensing and royalty agreements. • Represent nutraceutical brand in connection with enforcing legal rights in connection with unauthorized online sales and distribution, grey market sales, and minimum advertised price violations. • Advise skin care and beauty products brand in connection with intellectual property enforcement and protection.